I installed Gears, but I don't see the green or blue icon near my email address. What happened? I see Google Gears setting under Tools in Firefox. On third try opening Reader, I now see the icon. Thanks. Ahh I also got an error while trying to install! "Install Failed. Erorr code = 0x80004005"
I'm using Vista, if that helps. my pc is win2k so i can't test it (yet). i have a question about the offline google reader. can you read the complete article offline (you have to go to the main site, if it only shows snippets/summary)? Try closing the browser and then run the setup. You can read only what's included in the feed. So for partial feeds, you'll see only the first sentences. * Demos that test some of the features. They're mostly intended for developers. 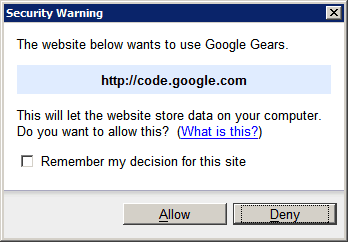 You'll see a dialog that asks your permission to use Google Gears to store data on your computer. IT works fine with Internet Explorer, with Firefox it doesn't show, tried four, five times. 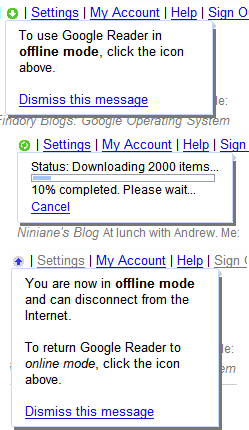 Offline Gmail access can't be too far off. And with it, I for one hope we see a decent, dedicated Gmail client that plugs into a locally-stored mail cache. In functionality it would basically be IMAP for Gmail. Install Failed. Error code = 0x80040800. I'm am having trouble. Is this not supposed to work with the old-style River? Because if not, I won't trade that even for offline. In any case, installed Gears, but didn't see any offline mode link/button. "Upgraded", remembered why I didn't want to use the new interface, but saw the offline link. De-upgraded, but got stuck with new interface. Button says I should upgrade to new Reader, but won't do anything. Help? I travel often and my usb memory stick with poratable apps is my saviour. Now if google gears works with the portable firefox all the worlds problems would have been solved. about create google gears by step-by-step or easy way. When will the calendar function and gmail function work with gears? i need to do language translations in my internal network(with out accessing the internet),can i get help frm Google gears to do this? google gears is a step in the right direction - but the download is much too big. one of the reasons flash became such a huge success was its incredibly small footprint. in the beginning, these downloads should be very very small, even at the expense of minimal functionality. if users access a GG-enabled app, the download should take 6 seconds on DSL ,and later-on, upgrades could happen in the background. just having access to sqlite even in a minimal fashion would be great. right now, I use .js files with JSON objects as my datastore, which is less than ideal, and doesnt allow real interaction with the client O/S, but at least I dont have to ask for this big download, which is what would immediately turn off my users, and cause them to not us the app at all. again, nice work and its great to have it available, but please, can't it be a smaller initial download? Gears would be more beneficial if Docs wasn't permanently in beta limbo. Having an online "office-like" tool is nice, but I don't need a dumbed down version of the real thing taking up more space on the hard drive. I hope Google can push Docs forward and fix the counter-intuitive issues it currently shows. Installed Gears on my 3rd party hosting WordPress (V2.6) blog and the user interface is coming up in a flash. Simply great. every time I use Gears to go offline, the number of unread items increases. Anyone have the same issue? 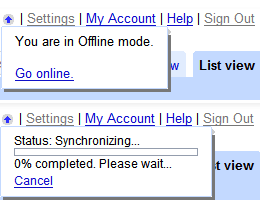 It would be great to have the type of synchronization it is already done for Offline Gmail. Thanks. Where the offline data containted? Should I download 2000 mails after reinstall the OS? Works with reader, but not with wordpress. any thoughts? I get error code 1612 when trying to install gears - what sall I do?